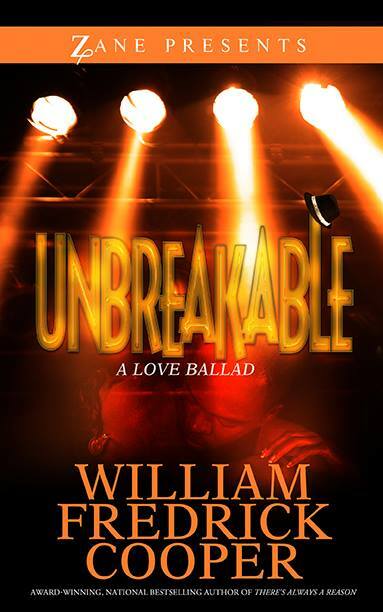 UNBREAKABLE (A LOVE BALLAD) is the third installment of the William McCall saga. (The critically acclaimed Six Days In January, and the Essence/Black Expressions Best-selling There’s Always A Reason) In a heartfelt story that also pays tribute to the legacy of Michael Jackson, we reenter the life of William McCall on Valentine’s Day, seven years after the death of Linda (Lucky) Woodson. Drowning his sorrows while struggling, he meets Keisha Gray, a Michigan schoolteacher visiting the Big Apple to end an affair with married Carl Austin, a powerful New York Attorney with an obsessive temper. Together, they sift through the wounds death, emotional baggage and physical trauma bring to find love, but will it come at a price too high for either of them to pay? UNBREAKABLE is powerful love ballad the explores God’s greatest emotion with truth, erotica, social statements, humor, courage, special guest appearances… and a little help from The Greatest Entertainer that ever lived. Uplifting and inspirational, Cooper also sheds insight on his personal struggles with a series of outstanding tributes to the creative engine behind his dreams, MICHAEL JACKSON. Simply put, UNBREAKABLE (A LOVE BALLAD) is an original work of art.